Clearly labeled “fruit.” It looks way cooler in Chinese characters, though. Our first Mid-Autumn Festival in China was very memorable for a number of reasons, including a nice big #Chinafail. I was mostly having a blast learning about what would quickly become my favorite Chinese holiday. We learned about Chang-E, the Jade Rabbit, moon gazing, pomelos, all of it. Of course, we also learned about mooncakes, which are kinda like Fig Newtons, but denser, richer, fancier, and more expensive. Oh, and traditionally have an egg yolk in the middle. It didn’t take long to figure out that our family preferred the all-fruit mooncakes. While not the most traditional, they pleased our palates more than the smoked walnut + ham + sweet lotus paste + mystery ingredient + egg yolk kind. 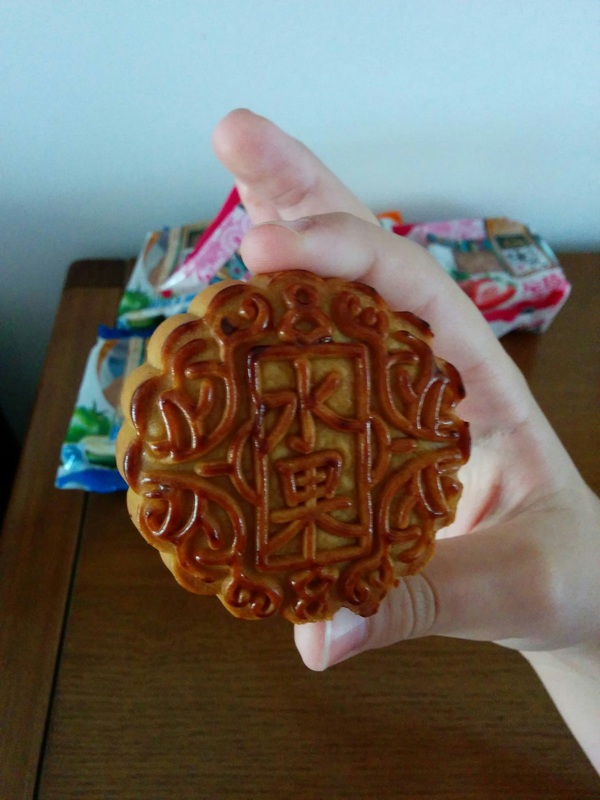 Since Mid-Autumn Festival focuses on being with family, and longing for the family you can’t be with, we thought we would share some fruity mooncakes with our families back home as a way to say “we miss you!” and introduce them to a little Chinese culture. Then came the challenge of packing the mooncakes. Preparing a box for shipping is one of those skills you have to re-learn in another country. What type of box is acceptable to use? And where would you get said box? Where do you put the label? Does the sender’s address go above or below the recipient’s? Which post office can handle international mail? “These are mooncakes?” The clerk asked, pawing through our boxes. “All mooncakes?” We at least knew that much – that the clerks would need to visually inspect the contents before we sealed the boxes, and that they would do the sealing with staple guns, not with packing tape. So enculturated. “ Yes, all mooncakes,” we affirmed, proud to understand the conversation so far. “You can’t send mooncakes,” she frowned. “You cannot send mooncakes to the U.S. It’s your country’s regulation,” she explained, as though we clearly should have been familiar with the U.S. postal service code about Chinese baked goods. I mean, aren’t you? We were perplexed that there would be this rule. The mooncakes were baked and factory sealed. How was this different than shipping any other food product, which we had done successfully before? The avian flu crisis hadn’t happened yet, but we still guessed the objection might be the egg yolk, since it was an animal product. “But these are the fruit kind. No egg yolks,” we explained. The clerk wasn’t going to budge. I was actually kind of surprised that she cared that much about a government regulation from a country half a world away. Bigger rules had been ignored many times before. “No, that’s the rule, and it’s your country’s rule.” Clearly she agreed that the rule was ridiculous, but it was our country’s fault. Her tone’s composition included one mole of accusation that it was our own personal fault, too. We were not getting anywhere with her. So, we gave up. Maybe if our Chinese had been better, or had we had guanxi with someone in the higher ranks of China Post officials, we could have won this battle to have our families experience the fruity wonder of non-traditional mooncakes. But it wasn’t to be. I miss you extra hard every day! I don’t need no moon cakes to keep you in my thoughts! They are mostly the lotus seed ones you’re talking about, though. I theorize it’s because most early immigrants to the U.S. were from southern China. Therefore most Chinese bakeries in America are run by Cantonese speakers. At least that’s how it is on the west coast where I’m from! That is great, Samantha! Thanks for the link. Yeah, I see some of them are from Hong Kong brand bakeries like Maxim and Kee Wah. I’m sure they are really good quality. Too bad they are so expensive, but it’s still a good resource. They sell moon cakes at a lot of places. 88 ranch types I’m sure. I’m guessing they’re made in the USA… not ‘authentic’ imports! Thanks, Edwin! That is good news for anyone who lives in a city with supermarkets like that. Are they pretty expensive? I was just looking on Amazon (US) and realized that the prices look almost like they just changed the ¥ to $. That is, a box of four mini mooncakes is about ¥20 here, and about $20 there. Eek. I guess you’d better really want them, and really enjoy them if you are living in the West.